The Gastric Sleeve has become the most popular bariatric operation because it is effective and because patient acceptance is high. Most of the stomach is removed, resulting in smaller stomach capacity as well as reduced hunger through reduction of hunger hormones. The Gastric Bypass has been done since the early 1980’s and has an outstanding track record of safety and effectiveness. The Gastric Bypass is especially effective for correction of Diabetes and severe Heartburn/Reflux. The stomach is significantly reduced in size, and food flow is re-routed to “bypass” the lower stomach and duodenum. Re-routing of the food leads to substantial correction of abnormal hunger and metabolic imbalance. The Biliopancreatic Diversion with Duodenal Switch (BPD-DS) is the most intense bariatric operation that is performed in the U.S. Not only does it have a smaller stomach and metabolic appetite reduction, it also rearranges the intestine to intentionally reduce the normal absorption of food. The BPD-DS has the most weight loss, but also a higher risk of vitamin/nutrition complications compared to the Gastric Sleeve or Gastric Bypass. In other words, our bariatric procedures make it easy to become full with a small amount of healthy food, and they should also help our patients be satisfied with small amounts of food. Currently, bariatric procedures are almost always done using minimally invasive techniques for the least pain, quickest recovery, and best visualization. In fact many of the laparoscopic techniques in use were first pioneered by Dr. Alan Wittgrove, who is the mentor of Sage Bariatrics founder Dr. Sonny Cavazos. Together, our group has performed almost 10,000 bariatric operations. 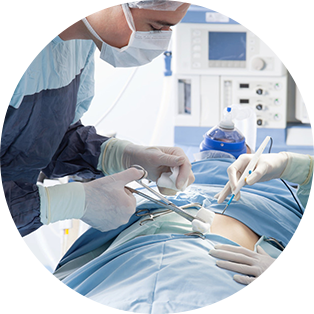 Our focus every day is to provide optimal bariatric surgical care, helping our patients get back the life they deserve.